The two human lungs are divided into multiple smaller sections by fissures. These sections are called the lobes of the lungs . 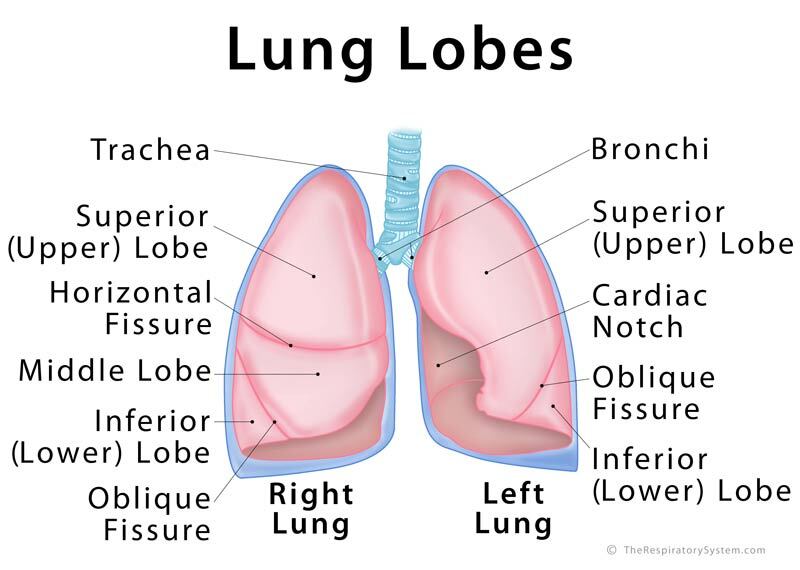 The right lung has three lobes, namely, the superior (upper), middle and inferior (lower) lobes . Unlike the right lung, there are only two lobes in the left lung: the superior (upper) and inferior (lower) lung lobes . The left lung is a little smaller than the right lung because it has to make space for the heart (the cardiac notch) in the left side of the thoracic cavity. As a result, the right lung is larger, having three lobes, while the left one only has two . The lobes are further separated into smaller segments, with the right lung having 10 segments and the left lung having 9 . 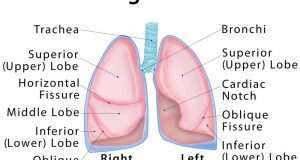 Although the left lung has only two lobes, there is an evident projection from the upper lobe, referred to as lingula which has two segments . The lingula serves as the equivalent to the right lung’s middle lobe in the left lung . Oblique Fissures: Separates the superior or upper lobe from the lower lobes of both lungs . Horizontal Fissure: Present only in the right lung, separates the middle lobe from the upper and lower right lung lobes . After entering the lungs, the right bronchus divides into three lobar bronchi, while the left bronchus divides into two lobar bronchi  – one for each of the lung lobes. These lobar bronchi then divide into tertiary or segmental bronchi. There are 10 tertiary bronchi in the right lung and 9 in the left, so each of the lung segments is supplied by one of these bronchial branches . The tertiary bronchi further branch into bronchioles to finally lead the inhaled air into the alveoli . All the lung lobes have the same primary function – receiving oxygen-rich air as it travels down the airways and housing the oxygen-carbon dioxide exchange in the alveoli . It is possible to remove one of the lobes surgically (lobectomy) in a life-threatening situation, like in a severe case of tuberculosis or lung cancer. This does affect the lung’s capacity, but in most cases, the person is still able to lead a normal lifestyle .